A perfect combination for photo gear and notebook computer, the CompuTrekker AW was designed specifically for digital photographers. Photojournalists and location photographers will find it a great travel companion. The backpack’s reinforced construction, shock-absorbing closed-cell foam padding and tough, water-resistant outer fabric protects contents from moisture and sudden impacts. The patented All Weather Cover™ offers maximum protection from extreme weather conditions, dust and sand. A padded notebook compartment is secured with both zipper and quick-release buckle; while the main camera compartment is fully customizable with adjustable padded dividers. 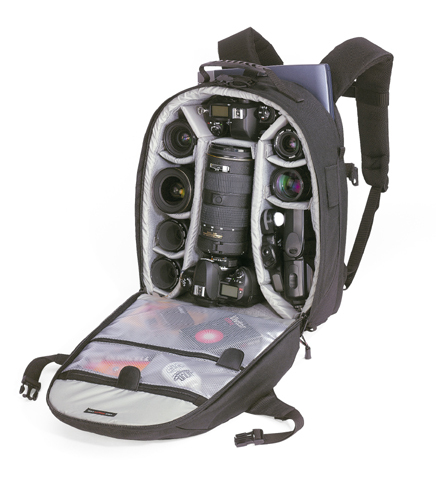 A quick-access hide-away Tripod Mount™, SlipLock™ attachment loops and a number of laminated and zippered organizer pockets provide photographers with fast, easy access to equipment.